A few weeks ago The Shin Guardian brought you a piece comparing the ’06 Yanks to their 2010 counterpart. A number of you commented or emailed about adding a comparison to the 2002 squad that Bruce Arena directed all the way to the semis. Player-for-played which team is better? Well, we decided to take the comparison in a different direction, a fun one. One of TSG’s readers, Ryan Rosenblatt, reached out and asked if he could participate. By all means Ryan. Here’s what we did. With Ryan and myself as playground “captains,” we decided to hold a draft with the pool of players coming from the 2002 and the 2010 teams. The main rule? That when a player was selected by one team the other team would be assigned get their opposite year counterpart. For example, if I selected Brad Friedel ’02 then Ryan would get Tim Howard ’10. By selecting in this manner, it would, theoretically, force the captain not to necessarily choose the best player, but to choose the better of two counterpart that creates the biggest talent disparity. With little to go on in terms of Bob Bradley’s 2010 line-up–and if Saturday proved anything either Coach Sweatpants is attempting a little misdirection with Fabio Capello or, yikes, still looking for combinations–I did as best I could to come up with comparable positions and players. Which Landon goes first? #21 or #10? Going forward, TSG will be known as “TSG” and Ryan’s team will be known as “TWNN” (“Team With No Name”) since he never provided one. TSG went first because we pay for the web hosting. 1. 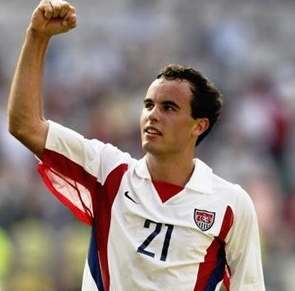 With the 1st pick in the USMNT World Cup “supplemental” draft, TSG takes John O’Brien out of Los Angeles, California. Defense: A tough first selection here and I honestly though long and hard about many other first picks. What won it for me is O’Brien breadth of skill. Able to hold in the midfield as well as possess as well as factor in the offense. He’s just a lot more dynamic in the midfield so the 1st nod of this draft goes to the 2002 team with O’Brien coming off the board first. 2. With the 2nd pick in the USMNT World Cup supplemental draft, TWNN takes Tony Sanneh out of St. Paul, Minnesota. Defense: Because you took O’Brien number one,who I would have surely taken in the same spot, I go for a player that was at his peak in 2002 (Sanneh) versus a player struggling in 2010 (Spector). Having recently rewatched the ’02 Portugal, Mexico and Germany matches, the level that Sanneh played at is fresh in my mind and his ability to play outside, come in and cover inside, as well as run the flanks and deliver a good ball won me over. He’s often the forgotten man on the ’02 team, but Sanneh’s play was extraordinary so the ’02 team has both of the two two picks. Excellent, excellent selection…and one that TSG debated with the first pick in the draft, but we felt it would sort of be like taking a top tight end in the NFL draft with the first pick….doesn’t usually happen. 3. 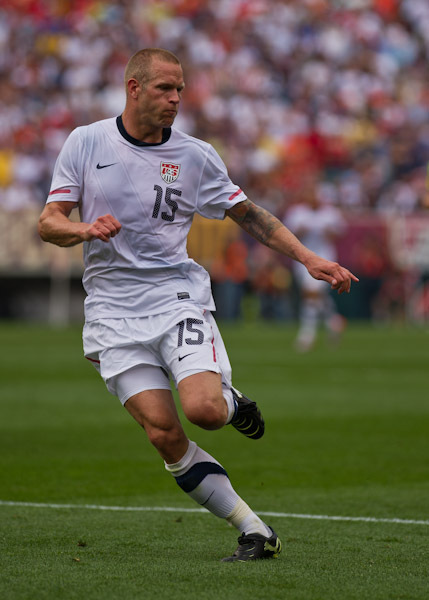 With the 3rd pick in the draft, TSG picks Jay DeMerit, pride of Wisconsin. Defense: Still reeling from the guy I thought I’d pick up with the 3rd pick, I’m starting to realize just how even these teams appear to be. 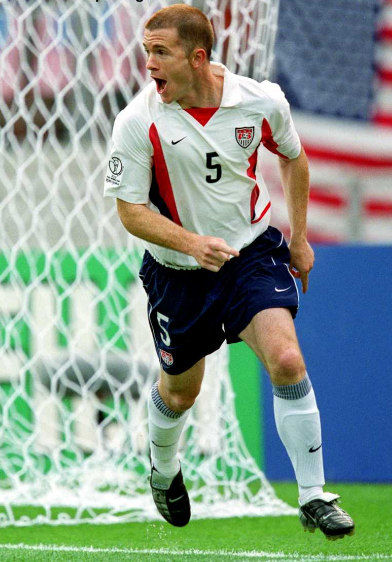 Maybe I was shaken a bit by your last pick, but TSG goes with competent Jay DeMerit vs. shaky Gregg Berhalter….yes that same Berhalter who could’ve had, should’ve had the most glorious goal in US history. Berhalter has always been a very astute player, only his physical gifts haven’t equaled that astuteness. After not playing in the first few matches, he started for an extremely ineffective Jeff Agoos. Had the US had more pressure on them against Mexico and Germany especially, Berhalther may be looked at in a different light today. For his part, Jay DeMerit has been world class against the World Class. While Hornet fans might lament his club form here and there, Jay DM has been near impeccable against top competition, beyond a single wonder move by Luis Fabiano. Had Jay DeMerit had more of an Ivy League English football education earlier in his career, he may have rivaled some of the best in the Premiership during the mid-2000s. Rather ironic as well that Berhalter as well as DeMerit, despite his impressive performances against Spain, Brazil and the Netherlands, were not automatic starter in the middle heading into their respective World Cup years. Jack of all trades, good 2nd half, master of none on Saturday. I think one thing that needs to be kept in perspective is that the US had a very different approach from half one to half two in the midfield. Per Bradley’s comments as well as….well…the television, the US pressed two central midfielders up the pitch in the 1st half, hoping to win possession and keep the ball in Turkey’s end. As we know because of poor service, poor possession maintenance, poor positioning and poor tackling, that plan didn’t work out all that well. In the 2nd half, you have to give credit to Michael Bradley for hawking all over the front of the pitch and allowing Jose Torres just to sit in the middle of the pitch, play positionally, be available for support, see the field and distribute balls. The MB90 role in the 2nd half was exactly what Maurice Edu played in the 1st half against Czechoslovakia. Again, it’s important to note that the strategies and tactics for both halves were very different. Having said that, my guess is that Clark had one last trial for a starting nod against England and he didn’t shine. Similar to Benny. If you read on below as well, you’ll see I think what Bradley was banking on in the 1st half. On the central defense combined with the midfield, I think you’re asking too much of your central defense–or conversely they didn’t follow the game plan or didn’t have one. My ratings were high for the central defense–perhaps they should be knocked down a tad–however you had Spector beaten inside three times in the first half; and you had Boca or the left side beaten twice. Turkey kept a player just forward or near the ball to ignite central attacks with the US zone. That’s your central midfielder here who has to recognize. Ricardo was consistently out of position and Michael Bradley whiffed on one tackle and went to the ground twice and left that same central defense vulnerable. I’m actually not blaming those two–I that’s a huge challenge for the central midfield to undertake. I think the first half of strategy by Bob Bradley showed a lack of adaptation–despite his forthcoming comments–after the opening whistle. Either the central “team” didn’t make an adjustment or the game plan wasn’t there. Agreed. Evan made this his first comment in our last piece and Jere Longman (a solid writer for the New York Times) wrote that in his game review as well. Exceedingly true. You could visibly see the difference in the JDM-Gooch partnership in the 2nd half. You can probably chalk it up to repititions and less pressure, but it was evident. Here’s my thinking on Onyewu and June 12th. He’s not there…yet. Bob Bradley said on Thursday that you were going to see many of his World Cup starters Saturday against Turkey. Onyewu was obviously not in the starting rotation. I don’t accept that Gooch was tired from playing on Tuesday so he didn’t start on Saturday. You know why? Because he played the entire 2nd half! If you were giving him 45 minutes and metering him to that, why doesn’t the first 45 minutes work? You can take him out at the half after the “starting unit” has built some cohesiveness. We saw Boca who just had hernia surgery–he played the first half and 30 minutes of the 2nd. Reason Onyewu was on only in the 2nd? Because he’s not there just yet. “The turnaround from the game against the Czech game was very quick–given where he is in the whole thing. We felt that 45 minutes made more sense and choose the 2nd half. It’s a good half from him. I think Bradley and staff are just pushing and pushing and hoping that Onyewu makes it by the 12th. It will now be interesting to see June 5th against Australia. You certainly can’t play Onyewu as sub in that one if he’s your starter. By the way, I think Gooch starts against England now given Bradley’s comments and the comfort of the team around him. » Benny Feilhaber: TSG gets a 7–right?–on it’s player ratings. Benny, decent with some balls in possession, a terrible errant ball in the 1st (I didn’t see it was him) and lackluster defense up the pitch. Poor call by TSG. » On Goodson and DeMerit: Okay, I’ve reviewed the tape. A lot they had to do. The cameras captured a great job of Howard hollering at them, but they didn’t capture when Goodson covered for Boca on an errant or when DeMerit shut down Spector’s side after he was beaten another time. First, let me mention that I knew there would be some challenges to my post-game review that I filed. Second, dead wrong on Benny Feilhaber from the little I have watched. My apologies. I completed my review on the train back to NYC about 4 hours after the Yanks completed their victory in the final home send-off game. I usually finish touching up my column right at the beginning of The Dead Zone. What I think is the strength of TSG game review is the detailed analysis that takes place so close to the end of the game. Usually TSG is not in the press box, so we’re writing before the major outlets are with immediate freshness. This time–with Bob Bradley quotes, player quotes and travel involved–I filed my column the next morning–at the beginning of the green section (I have no name for this section). I had completed it within 8 hours of the match though. However, the timing left some of the freshness and game review asunder and consequently, my review was not as “tight” as I would have liked it to been. Okay, enough, what does this mean? Not one of my best reviews, but then again you can’t fit everything into one. Best part? I’m my own assignment desk and editor! So today I’m going to add to start in this column and then during the day–and since Virgin America’s wifi bandwidth is not strong enough to pull up “The Tres” from ESPN–I’m going to re-watch the game and add more commentary in a new post when I arrive home. I may make some changes to my review or stick to my guns. I’ll be taking selections out of Saturday’s commentary and using them as starting points here. Pardon the digression…and we start with the Turkish goal. “The comment though was simply the reactions when the ball took over. When Jonathan had made the run, the ball came loose, it got played up. We actually put a little bit of initial pressure on. Goodson, I believe, pushed pretty high now to try to shut things down. The next level of reactions weren’t that good and they were able to play the ball down the left side and create that opening. It’s about a team reaction when the ball turns over. You want the initial pressure to give everybody else an idea of what they need to do. In some cases, the next guy can join in and maybe it can be taken care of right there. In other cases, it’s a re-grouping behind the ball. “You have challenges, the way Turkey plays there is a lot going on in the center part of the midfield, especially in the 1st half. You’re asking a great deal of your center midfielders because they have to be able to step up and press in front of them, but also be aware of what’s going on behind them. At the very least, if you’re Ricardo Clark, you want to do something different and force that ball a different way based upon communication behind you or game plan. You want that ball to the winger to be airborne–if it has to go there, as the pass will travel slower, allowing the defense to recover and the player might have to take an extra touch or two to recalibrate his run to the goal. A good day and Decoration Day to everyone. A big thank you to all those who have passed in the line of duty….and those who have served or are serving home and abroad. Deuce was extremely calm on the ball netting the game winner. 75th minute again for Deuce....like clockwork. Read on. In the final game before the trip around half the world, the USMNT set their guns to “blaze” in the 2nd half after accepting attack volley after attack volley from the Turks in the first. Former Fenerbache player Colin Kazim-Richards found a leaking Arda Turan up the left wing in the first half to open the the scoring for the visitors, but US punched back after halftime through Jozy Altidore and Clint Dempsey, beneficiaries of Landon Donovan the playmaker. The 2nd half saw an urgent group of Yanks push the tempo, link shorter passes and overwhelm a Turkey team that wilted in the humidity of Lincoln Financial Field. 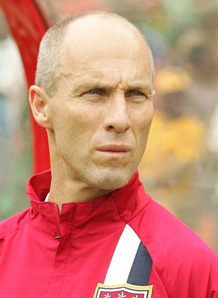 Coach Bob Bradley was measured in his post game comments and said that the introduction of new players in the 2nd was key to the US gaining the win. Bradley also commented that the US game plan was to hold shape as best as possible in the first, absorb offensive pressure from a talented Turkey team, and strike later in the match. And open up they did. 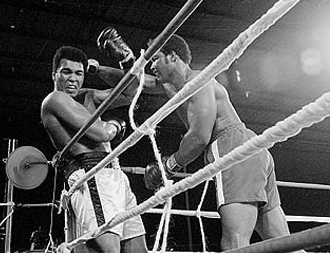 Whether it was a halftime speech, the insertion of key components, or merely a pre-meditated game plan, the Yanks looked the part of World Cup contenders during the final 45′ plus after sitting on the ropes with Turkey playing the role of George Foreman to the Yanks’ Ali. A 1st half that saw balls lobbed up the pitch and the tandem of Clint Dempsey and Jozy Altidore not able to create opportunities, much less keep possession, gave way to the 2nd which saw a more staccato array of passes linking through the middle with the threat of Robbie Findley’s speed opening up the space there. Cue the counter punch. With Deuce tucking in at left half, Landon on the right–where he played nearly whole game–and more accurate and simpler ball movement from conductor Jose Torres in the middle, the US midfield attack dominated the Turks. The English media are going to have a field day over this result. It would be nice if they actually supported their national team but then it wouldn’t be England now would it. I didn’t think its possible for a team to play so poorly against a team who played quite well and win but England did it. Their second half was much better then the first both defensively and offensively. They maintained possession a little more and actually had decent opportunities to score but lets not gloss over anything. 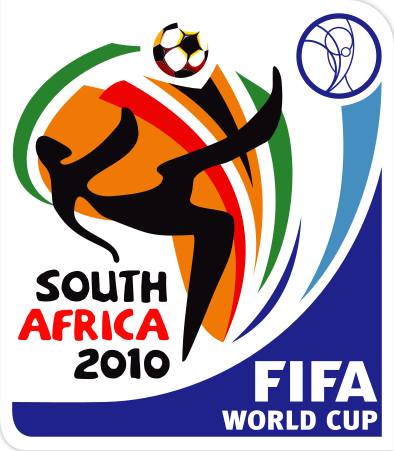 England were very poor and this sort of play will not do them any favors in South Africa. Kudos to Japan as they proved they belong at the WC and should give their Group E opponents some trouble. They just got to maybe deal with clearing incoming crosses a little better! TWEEET TWEET TWEET – Game over…thank god. 90:00 – Japan take a corner and a random touch has the ball bounce of the England bar. That would have been a comical goal as neither team had any idea what was happening. 89:00 – From the resulting goal kick Gerrard gets the ball on the wing and sends a lovely cross into the box that Heskey dives onto but his header is just wide. Better from England. One would hope that next time they play (June 12th) they will have their “stuff” together. 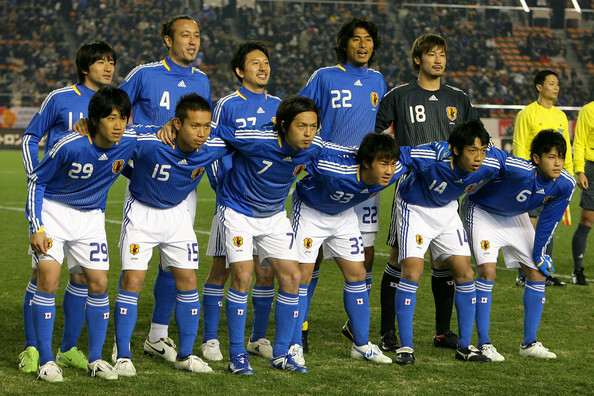 88:00 – Japan with a free kick about 45 yards out. Specialist Honda lines it up but his shot goes over the bar. Really raining hard here in Austria. 83:00 – GOOOOOALLL – Ashley Cole. That was more of a cross than anything else and actually is an own goal by Nakazawa. It was a difficult cross to deal with as was Joe Coles but England now lead 2-1. 82:00 – SWP gets the ball and moves it across the halfway line and tries to play in Heskey who lumbers onto it but can’t keep it in play. 81:00 – England pass it around nicely with some nice one twos between Rooney and Gerrard with the latter latching onto it but is well muscled out. Nicer from the three lions. 75:00 – Heskey on for Lennon. Lets see if him and Rooney can create that “magic” they have together. Torres had a great game and was everywhere. Ball control was superb and his tackling was also very good. The USMNT played much better the second half. They played more cohesive football and taking Spector off was huge. Torres also showed more ball skill then Clark I feel. They key for me though was Findley, who certainly played himself into the starting 11 while showing strength, touch and a fine eye for the game. Altidore got the goal, but Findley was the better player for me. Bornstein played himself out of anything. Deuce got himself a nice individual goal and the US set themselves up with some chances they should have scored. A much better performance then against the Czech and kudos to Turkey for coming out and playing hard. Next up for the USMNT an actual WC opponent. Australia! 90:00 – US win a corner as the US have had much better possession and ball control the second half. Their defense was improved but they still gave up way to much off the ball and Bornstein was just awful. He really needs to regroup as he is better then this. As I write this he is turned around yet again as he over commits and another great cross is sent in. Luckily for the US no one from Turkey is there to meet it. 87:00 – Bradley shows his attacking prowess as Holden sends a great ball for Bradley to latch onto. Instead of shooting though he pulls it back for Dempsey who shots narrowly wide. Deuce should have done better but nice build up from the USMNT. 86:00 – Over 55k at the game. Great showing US fans. Fantastic send off. 84:00 – Off a free kick Howard pushes it over the bar. Corner for Turkey but the training ground plan does not go off for the Turks.